The local food movement has taken off in Vermont. You’ll find certified organic milk from local dairies (no antibiotics here and no feed grown with chemical fertilizers and pesticides!) Eggs in the omelets are local. Steaks, chicken, berries, carrots, spinach…you name it…all local! And folks have always been able to enjoy the local Vermont maple syrup and cheeses that we’re already so well-known for. 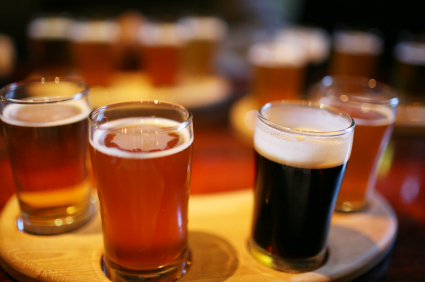 The latest buzz, though, is about the brews. Now, when you order a drink to go with that Friday night hamburger (from a local cow, of course), you’ll also have the opportunity to enjoy a delicious “locally grown” beer. Vermont tops the list of U.S. state breweries (per capita) based on the Brewer’s Association’s count of operating breweries. We are lucky to have a brewery for (roughly) every 25,000 people! But it’s not just that we have great beers. We also have what has been voted the best beer in the world! Hill Farmstead Brewery in Greensboro Bend, Vermont…named 2013 Best Brewery in the World by RateBeer (out of 13,000)! Hmm….another great reason to come to Vermont! The craft beer industry has sprung to life in Vermont, and the Vermont Department of Tourism offers a “passport” encouraging beer lovers to enjoy the many breweries. You can collect stamps from each brewery you visit which can then be traded in for prizes. So come on up to Vermont and enjoy the Vermont brewery challenge with your choice of brews from: 14th Star Brewing, The Alchemist, Backacre Beermaker, Bobcat Cafe and Brewery, Covered Bridge Craft Brewery, Crop Bistro and Brewery, Drop-In Brewing Company, Fiddlehead Brewing Company, Foley Brothers Brewing, Grateful Hands Brewing, Harpoon Brewery, Hill Farmstead Brewery, Kingdom Brewing, Lawsons Finest, Long Trail Brewing, Lost Nation Brewing, Madison Brewing, Magic Hat Brewing Company, McNeills Pub and Brewery, Northshire Brewery, Norwich Inn, Otter Creek Brewing, Rock Art Brewery, Switchback Brewing, Trapp Family Lodge, Trout River Brewing Company, Whetstone Station, Vermont Pub and Brewery and Zero Gravity Craft Brewery. Just another wonderful reason to come to Vermont. And remember – look – agitate – smell – taste … and enjoy! Check out Discovery Bicycle Tours in Vermont where there are many opportunities to enjoy these enticing microbrews! This entry was posted in Maryland Bicycle Tours, Vermont Bicycle Tours and tagged adventure, bicycle, bicycle tours, bicycling, bike, biking, Brewery, cycling, Discovery Bicycle Tours, Harpoon Brewery, Hill Farmstead Brewery, inn-to-inn bicycle tours, local food movement, Magic Hat Brewing Company, organic, Otter Creek Brewing, Rock Art Brewery, Trapp Family Lodge, Trout River Brewing, vermont, Vermont Brewers, Vermont Department of Tourism Passport. Bookmark the permalink. Hi! This post is awesome and I’d like to talk about featuring it on our new travel site. Please let me know if you’re interested. Hi Andrea ~ Thanks and yes, of course! What’s your new travel site? Great! Would you mind giving me your email address so that I can explain / send you more details? Absolutely…dawn@discoverybicycletours.com. Will look forward to seeing more details.Thanks!